Adding a new level of sophisticated luxury and further cementing Nanuku Auberge Resort’s position and its overall product delivery in place at the very top of the Fiji resort listings, 13 new luxury one and two-bedroom ‘Auberge Beach Villas’ are bang on schedule for their official opening in October this year. 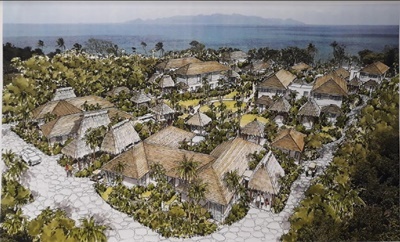 One of the biggest resort developments to take place in Fiji in recent times, work is well underway on the beachfront site project following a traditional ground-breaking ceremony conducted by local chiefs, village elders and other local dignitaries. When complete and ready for guests, each of the Auberge Beach Villas will come complete with state of the art kitchens, private swimming pools and private open terraces offering the very best in both indoor and outdoor living fronted by a pristine, three kilometre-long white-sand beach and the resort’s own pristine house reef. An added benefit for guests staying in an Auberge Beach Villa is the opportunity to combine an intimate and very private villa style holiday in their own environment or, as desired, take full advantage of the fact they also have access to a full resort offering an award-winning restaurant and bar, a spa and wellness centre and a myriad choice of both on and off resort activities. A very proud Nanuku Auberge Resort GM, Sascha Hemmann said the ground-breaking event represented a watershed moment for Fiji’s tourism industry. “There can be no doubt we raised the bar considerably when we first opened our doors under a ‘Nanuku Resort & Spa’ branding in early 2014,” Mr Hemmann said. “The changes that have taken place since then, including a major rebranding as part of the internationally-acclaimed and highly respected Auberge Resorts Collection, have truly positioned us in place as one of the most desirable resorts to be found in Fiji and further afield in the South Pacific.